Pope Francis said on Saturday he would be “sincere” with U.S. President Donald Trump over their sharp differences on subjects such as immigration and climate change when the two hold their first meeting at the Vatican later this month. 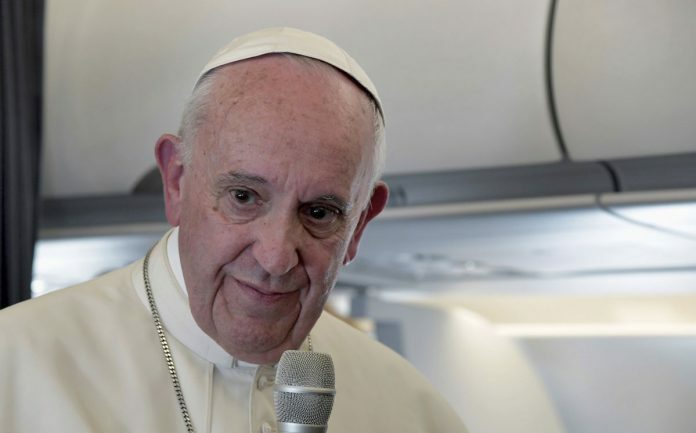 But the pope also told reporters aboard a plane returning from Portugal that he would keep an open mind and not pass judgment on Trump until first listening to his views at their meeting on May 24. “Even if one thinks differently we have to be very sincere about what each one thinks,” Francis said in a typically freewheeling airborne news conference. The pope’s meeting with Trump could be potentially awkward given their diametrically opposed positions on immigration, refugees and climate change, which he told reporters on the plane “are well known”. Last year, in response to a question about then-candidate Trump’s views on immigration and his intention to build a wall along the U.S. border with Mexico, Francis said a man with such views was “not Christian”. The two men also disagree strongly about climate change. Trump signed an executive order dismantling Obama-era environmental legislation. Still, Francis said he was willing to find common ground with Trump. “There are always doors that are not closed. We need to find the doors that are at least partly open, go in, and talk about things we have in common and go forward, step by step,” he said. Trump will visit the Vatican during a tour of the Middle East and Europe that will also include a meeting in Sicily of the leaders of the Group of Seven leading economies. The pope is a head of state as well as being leader of the world’s 1.2 billion Roman Catholics. Such meetings allow for an exchange of views on world affairs and a chance for the pope to encourage ethical solutions to world problems. About 21 percent of Americans, or 70 million people, are Catholic. Washington has had full diplomatic relations with the Vatican since 1984, when President Ronald Reagan saw Pope John Paul, a Pole, as a crucial ally against communism. With sharp differences on subjects such as immigration and climate change, the Pope and Trump to hold their first meeting at Vatican on May 24.